Finite elements modelling is a numerical simulation technique that allows the determination of the stresses developed inside an object following the application of a system of mechanical or thermal loads; it is often the only method that can be used to assess its tensional state, since for complex geometries the direct analytical solution of the static problem is not possible. 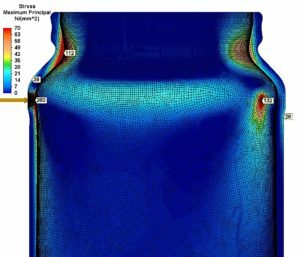 FEM analysis is an indispensable tool for the validation of container design, for example to check for any critical points due to the shape or weight distribution of glass, to identify weak points, or for the optimization of new containers. 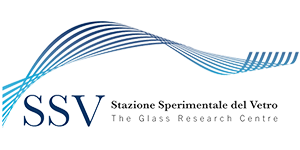 For over 25 years SSV has dedicated a whole team of engineers to the study of the mechanical properties of glass containers and the assessment of their performance on the market. FEM analyses are carried out in combination with experimental tests, whose results are statistically elaborated (according to Weibull’s distribution) to determine the probability of fracture of the containers in use.